When it is called terrorism? So, here it is. The white man might have a different political ideology, or acts by himself, or has a mental issues, or might be affected by the violence he sees on video games but he can’t be a terrorist. Meanwhile, people caught planing an attack are called terrorists even if they acted by themselves. Spoiler Alert about the first episode only: Don’t continue if you are going to watch the show. Each episode is 90 minutes long. In the first episode, a small city is preparing to host an international art exhibit on the prophet Muhammad. Meanwhile, Muslim demonstrators have been holding daily protests and the town is affected by a blackout, killing of the museum director along with other people, five car explosions and taking a Minister as a hostage. Detective1: [reading the newspaper] Madman who took the Minister hostage is a former soldier. He is thought to be behind the recent chaos in Ystad. Detective2: So it’s chaos now, eh? Not terror anymore. 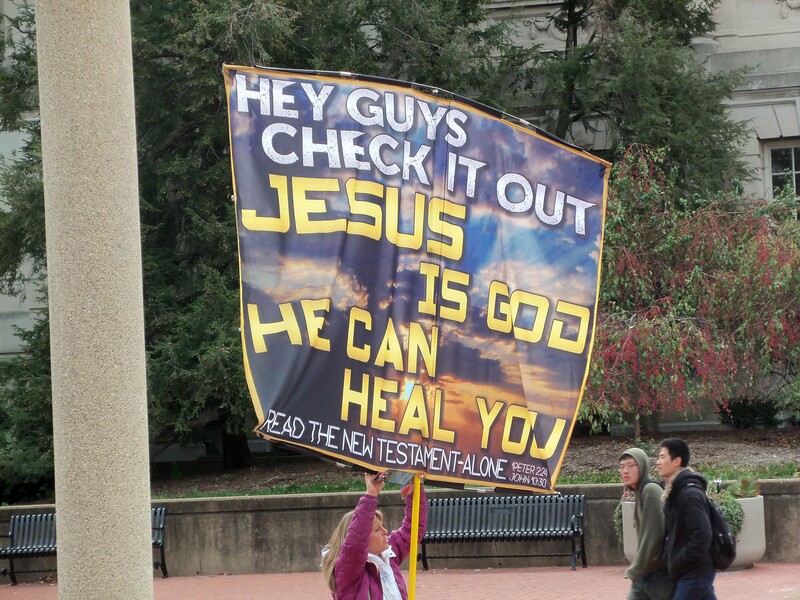 A woman on campus spreading the word about Jesus. 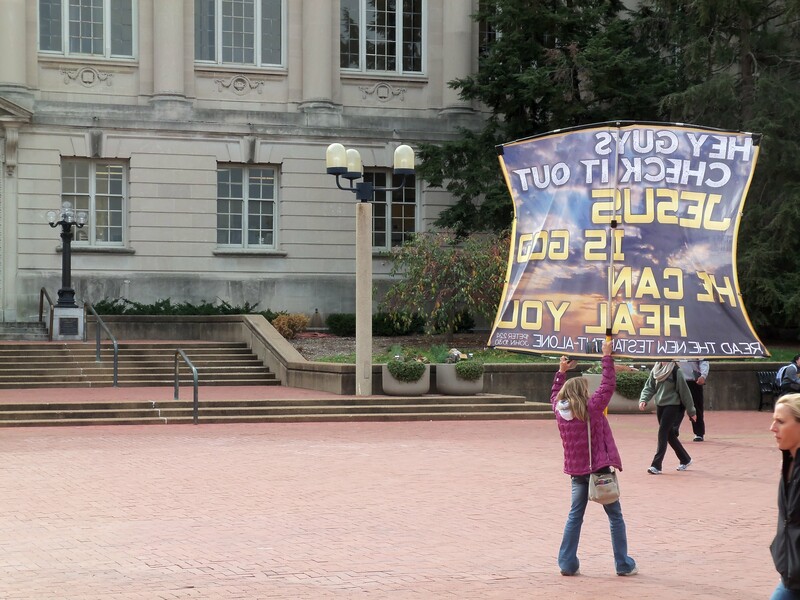 This is something common here on my campus. A Christian man sometimes hand students pocket size bibles for free. 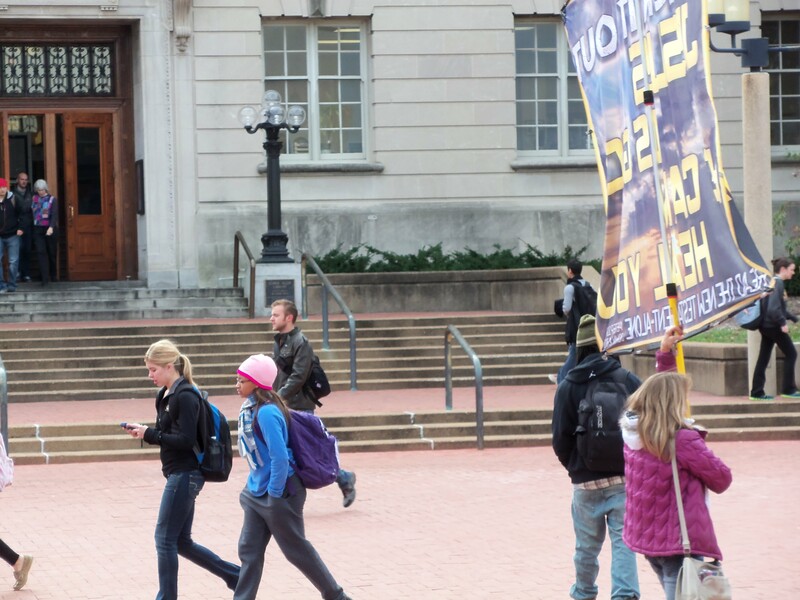 Some other Christians come to campus and talk passionately about controversial issues like homosexuality and abortion. Also they talk in general about sins, punishments and repentance. That is, 70% of Swedish trust others while only 10% of Turkish trust others. The figure below is very interesting! Unlike America, trades in the Middle East do not involve fine prints chosen carefully by a group of lawyers. In the Middles East, a transaction between a merchant and a customer is so simple. Shops have only one policy. The shop’s policy is written in a large print and hanged up inside the shop in a place the customer can see it as soon as he enters the shop. Many business owners hang it up behind the cashier. If you saw an American tourist at an Arab shop, especially a boutique, pulling her hair out you should know it is because she can read Arabic and that she read the large printed sign. The one simple policy is “Goods sold will not be replaced or returned.” Meaning, once you paid for an item you can’t have a second thought. You should be 100% sure that the dress fits you perfectly and you like the color and everything else about the dress. This is customer service in the Middle East in a nutshell. Very simple and clear! 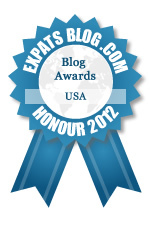 In the US, customer service has a whole different meaning. Its entire economic success is due to almost a perfect customer service. Unfortunately, customer service here is deteriorating due to outsourcing and to foreigners exploiting this new culture of customer service experience. Many big companies, moved their customer service to India. One major problem is the language. Many of the reps answering the phones overseas don’t have good communication and English language skills. A friend who worked as a customer service rep in India, before coming to the States, told me that his American company employer had daily screening of the American sitcom Friends. The company wanted their customer service reps to practice English and also learn about the American culture as well and they were forced to speak English only as long as they are inside the building. Two days ago I was on the phone with a customer service rep. The young guy on the other side of the world wasn’t from India but from some other Asian country. His English was so bad and I am very good at interpreting broken English. I am very sure if an American made that call he would have never stayed on the phone beyond the first sentence. The culprit company is Simple Mobile. Unfortunately, they decided to move their customer service to even a cheaper place than India. Stealing: Someone would enter Walmart pick up a TV go to customer service and tell them he wants to return it back. Yes, back then you can even return an expensive item without a receipt. Exploitation: Someone moves to a new house and finds out he needs to use a drill to hang up some frames. He goes to Walmart buys one and returns it back once done. Misuse: We have an Arab proverb that says “If your lover is made out of honey, don’t lick it all.” Meaning, if someone is very kind to you, don’t take advantage of the situation. Some people think because they can return goods they should do it all the time. I am not saying that only foreigners do this but they take advantage of it more than locals who worked very hard to establish this amazing customer service. Because of the above three examples, customer service is not as used to be in the US and also is different from one city to another. I heard that in big cities like Houston for example their customer service and returning goods is not as easy and good as here in Columbia, MO. In general, there is no difficulty in returning purchased items here. In some cases, you can even return goods without having a receipt. One week after returning from Walmart, I found out that I was missing a couple of things I bought. I think I have forgotten to put one of the plastic bags in the shopping cart after being registered by the cashier. I know exactly what I had in the bag because that day I only bought few items including two duct tapes I went especially to buy. The customer service lady, lets call her Kim: How may I help you? Me: Hi, I was here about a week ago and it seems that I forgot to pick up one of the bags at the cashier. Is it possible that you may have it? Kim: Do you remember when was that? Me: Not very sure. More than a week ago. Kim [looking into the notebook and turning over pages]: mmm… I am afraid I can’t find it. Me [preparing to leave while smiling]: Okay, no problem. I just thought to give it a try. Kim: Tell you what go get these items and I will bag them for you. Me: Oh, are you sure? I don’t have the receipt! I went to get the same stuffs I bought thinking what made her “trust” me that I am not going to throw a couple more things in the basket or buy the more expensive brand instead of the more affordable ones I usually buy. I was happy I asked but was more moved by such great customer service which after all depends mainly on an important human trait called trust. Sadly, at some period of time -not sure when- something happened that changed Muslims. I am struggling to understand the reason behind this change. I don’t know how many authentic Hadiths are there but there are as many, more or less, Hadiths about Muslim’s relationship with Allah as there are about his relationship with others. Sometime ago, Muslims abandoned the quite many and sufficient Hadiths about ethics, manners, morality, behavior and what not and concentrated more on Muslims’ relationship with Allah. The same Muslims who know by heart the virtues of fasting on the day of Arafa (Islamic holy day) are the same who speak ill of others. Our relationship with each other is as important as our relationship with Allah. This dual relationship between a slave and his Master and between a slave and another is one entity. I have never imagined that my love for history is going to be one of my strengths. I once wrote in my journal how we all are blueprints planned by our parents. Strangely, this test mentions the word “blueprints” as well which I found quite intriguing. My theory is who we are, until a certain age, goes in coherent with our parents’ blueprint of us. Our development in life is the execution of this blueprint. Strength – Context: People who are especially talented in the Context theme enjoying thinking about the past. They understand the present by researching its history. You look back to understand the present… The earlier time was a simpler time. It was a time of blueprints. As you look back, you begin to see these blueprints emerge… This understanding brings you confidence. No longer disoriented, you make better decisions because you sense the underlying structure. You become a better partner because you understand how your colleagues came to be who they are. And counterintuitively you become wiser about the future because you saw its seeds being sown in the past. Chances are good that you diligently examine past events. You find patterns that keep recurring. This information allows you to anticipate what can happen in the future. You grasp the meaning of George Santayana’s warning: “Those who cannot remember the past are condemned to repeat it.” Driven by your talents, you really like to read about past events and the key people involved. By accumulating lots of knowledge regarding days gone by, you regularly anticipate the opportunities and pitfalls you are apt to face in the coming months, years, or decades. By nature, you create a vision of the future by unraveling what happened in the past. You strive to understand the what, when, who, where, how, and why of events. You are determined to create a framework of facts so you can put things in perspective. It’s very likely that you are quite intrigued by history’s significant events and people. Information about global conflicts fascinates you. Because of your strengths, you are inclined to read about major wars. While some people find this topic boring or irrelevant, you are quite fascinated with it. Whenever you read about global conflicts, you feel impelled to collect more information. One book or article is likely to lead you to another then another. You experience the story of humankind unfolding before your eyes on the printed page. Egyptians used encryption as a way to communicate messages in obscure form. Julies Caesar wrote his strategic letters in cipher, that is, by so changing the order of the letters of the alphabet. He replaced every letter with the fourth letter; A becomes D, Z becomes C and so on. A very smart way to send a concealed message is to to shave the head of the messenger, wait till his hair grows back again and send him to the recipient. I am not sure who used this technique but I it is definitely very intelligent. One way to solve an encrypted message, if we know its language, is to find a different plaintext of the same language long enough to fill one sheet or so, and then we count the occurrences of each letter. We call the most frequently occurring letter the ‘first’, the next most occurring letter the ‘second’ the following most occurring letter the ‘third’, and so on, until we account for all the different letters in the plaintext sample. Then we look at the cipher text we want to solve and we also classify its symbols. We find the most occurring symbol and change it to the form of the ‘first’ letter of the plaintext sample, the next most common symbol is changed to the form of the ‘second’ letter, and the following most common symbol is changed to the form of the ‘third’ letter, and so on, until we account for all symbols of the cryptogram we want to solve [source]. The first known recorded explanation of frequency analysis (indeed, of any kind of cryptanalysis) was given in the 9th century by Al-Kindi, an Arab polymath, in A Manuscript on Deciphering Cryptographic Messages. It has been suggested that close textual study of the Qur’an first brought to light that Arabic has a characteristic letter frequency. Its use spread, and similar systems were widely used in European states by the time of the Renaissance [source]. I can’t find an answer of how a nation that used to be pioneer in science is now tailing behind every other nation in a dramatic way. Europe was a pioneer in science before WWI and WWII and they managed to get back on track after the war. Japan as well after the atomic bomb they stood up even better than they used to. The question is why Arabs still performing extremely bad in science? I know it is not the case when it comes to individuals because Arab scientists and researchers are doing great in Europe and the United States. We have the money and we have the brains but, unfortunately, we fail in leadership. Without good leadership we can’t build a successful organization or nation. Many years of research conducted by The Gallup Organization suggest that the most effective people are those who understand their strengths and behaviors… A review of the knowledge and skills you have acquired can provide a basic sense of your abilities, but an awareness and understanding of your natural talents will provide true insight into the core reasons behind your consistent successes. My first strength is Connectedness. I was shocked when I read what connectedness is. I feel it describes me perfectly. My boss told me that very few people have this strength and it is a very positive thing to have it as a first strength. Okay, enough bragging 🙂 To understand and improve my five strengths I will share it with you. Because we also need not take these strengths for granted. Things happen for a reason… You are sure of it because in your soul you know that we are all connected. Yes, we are individuals, responsible for our own judgments and in possession of our own free will, but nonetheless we are part of something larger… you gain confidence from knowing that we are not isolated from one another or from the earth and the life on it. This feeling of Connectedness implies certain responsibilities. If we are all part of a larger picture, then we must not harm others because we will be harming ourselves. We must not exploit because we will be exploiting ourselves. Your awareness of these responsibilities creates your value system. You are considerate, caring, and accepting. Certain of the unity of humankind, you are a bridge builder for people of different cultures. Sensitive to the invisible hand, you can give others comfort that there is a purpose beyond our humdrum lives. The exact articles of your faith will depend on your upbringing and your culture, but your faith is strong. It sustains you and your close friends in the face of life’s mysteries. I like movies that are based on true stories. Yesterday, I watched one called Argo which is another good movie by director Ben Affleck. I very much enjoyed his directing job in his previous two movies; Gone Baby Gone and The Town. The movie is about a risky plan put by the CIA to free six Americans who have found shelter at the home of the Canadian ambassador during Iran hostage crisis. I am aware of the Iran hostage crisis that happened in 1979 but what I didn’t know is that it lasted 444 days. This is a very long time to be a hostage. It would be very interesting to read or maybe to watch a movie about the ordeal experienced by the hostages. I don’t think anyone of us can imagine living 444 thinking that he can be executed at any moment. What did they do? What was going on daily? How did they pass the time? Their families should have suffered a lot waiting and not knowing what will happen to their loved ones. The question is could this dilemma not lasted that long if America didn’t insist on protecting a dictator? Long time ago, I read a book about the Savak’s torturing and execution of the regime’s opponents. They were feared so much by the Iranians because of their notorious operations. Of course, the Shah established the Savak but more dangerously it is “Formed under the guidance of United States and Israeli intelligence officers in 1957, SAVAK developed into an effective secret agency.” Apparently, the movie mentioned nothing about the United States involvement in Savak. And most probably Americans don’t know about Savak. As in any American movie, Americans are the good guys and others (Russians, Cubans, Iranians and now Arabs) are the bad guys. I am not sure how long this mentality of we are good others are bad is going to last because it really hurts America more than it benefits it. Here is another example (Taken 2) of how Hollywood likes to make religion a centerpiece because it generates more audience than if the villains are some bad people from New York or LA. 1953: U.S. overthrows Prime Minister Mossadeq of Iran. U.S. installs Shah as dictator. 1973: U.S. stages coup in Chile. Democratically-elected President Salvador Allende assassinated. Dictator Augusto Pinochet installed. 5,000 Chileans murdered. 1980‘s: U.S. trains Osama bin Laden and fellow terrorists to kill Soviets. CIA gives them $4 billion. 1981: Reagan administration trains and funds “contras.” 30,000 Nicaraguans die. 1982: U.S. provides billions in aid to Saddam Hussein for weapons to kill Iranians. 1983: White House secretly gives Iran weapons to kill Iraqis. 1989: CIA agent Manuel Noriega (also serving as President of Panama) disobeys orders from Washington. U.S. invades Panama and removes Noriega. 3,000 Panamanian civilians Causalities. 1998: Clinton bombs “weapon factory” in Sudan. Factory turns out to be making aspirin. 1991 to present (2002): American planes bomb Iraq on a weekly basis. U.N. estimates 500,000 Iraqi children die from bombing and sanctions. I can’t read the number below but I know that most Americans blame greedy banks and Wall Street executives for their 2007/2008 economic crisis and not the war. It could be because many Americans believe that all their wars are justified and that these wars are only to defend and protect them from the evil others. Anyway, I enjoyed watching Argo. It is a good entertaining movie. The most important sentence in any article is the first sentence. It is the one sentence that determines the One sentence that determines the w the life of an article. The first sentence always causes me a headache. I spend m Sometimes, I spend more time on trying to come up with the perfect sentence than the time I spend writing my post. a post. I hate the first sentence I am even dedicating this whole post for it. complaining about it. ranting about it. Many times, I think of an excellent topic for a post but it ends up in my drafts folder because I couldn’t figure out what the first sentence should be. I have more than 200 drafts because of the stupid first sentence. I am not sure what type of article I am writing now. It doesn’t have content and a closing statement. It only has an opening and a very bad one indeed. A very bad one indeed. I am just ranting here. about the stupid first stamtenet Sorry for wasting your time. But I have to say it is your fault, once you didn’t like the first sentence you shouldn’t continue reading. Anyway, thanks for suppor your patient trying to figure out what I am up to. I am just an amateur writer trying to come up with a good first sentence just barely good sentence. So far, I haven’t been in any hotel or motel room in the U.S. that doesn’t have a copy of the Bible placed near the bed. 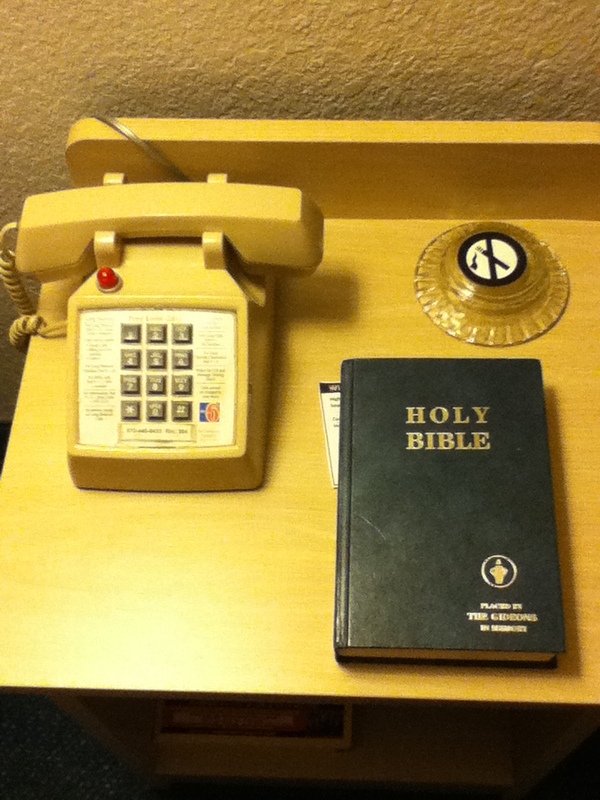 I am not sure if it is a good idea to place Bibles in hotel or motel rooms. When I worked as a hotel housekeeper many times I find the bible thrown on the floor or given to a child to doodle on it. On YouTube there are videos of people playing with the Bible, throwing it at each other. But really if you like a book you don’t want it to be in a hotel room especially if you believe this book is holy. Why place a holy book in a room that you KNOW is going to be used, sometimes, to commit adultery and other sinful acts? A Muslim group in Chicago came to our mosque last year to collect donations to place copies of the translated Quran in hotels. I was shocked as many other Muslims. I don’t think it is a good idea.